Spring is here! And the Lager is the reigning king during this time of the year! Since the 19th century this German beer recipe has been the staple for American beer aficionados. Lagers are crisp, slightly more carbonated than its Ale counter part, nice bitter bite, generally golden in color and tastes so damn refreshing on a hot So Cal summer day! The Big Three…Budweiser, Coors, Miller, brew Lagers in mass production, and some indie craft beer companies like; Anchor Steam and North Coast Brewing make some of the best tasting Lagers on earth! So for the next couple of months, I will be reviewing beers geared for the Spring and Summer seasons, generally -Lagers and Pale Ales. I thought pointing out some interesting facts about Lagers would be neat and helpful for my future reviews. 1.) Lager in German means “Storage” – Germans used a bottom brewing fermentation process that used low temperatures to condition the beer. Alpine caves was the ideal staging area to condition and store these style of beers. 2.) Fermentation process takes longer than ales, generally three months – brewed late winter and stored in caves and taped in spring! Thus, Lagers widely consumed during the spring and summer seasons. 3.) Ales was widely consumed in the U.S. during the 17th and 18th, but made a surge in the 19th century, when German brew masters immigrated to the U.S. and has been a juggernaut ever since. 4.) Different styles of lagers: Bocks, Pilsners, Pale Lagers, Doppelbocks, Dunkel, Schwarzbier, just to name a few. 5.) Color of beer ranges from golden to dark cooper and avg. alcohol by volume 4 abv to 9 abv. 6.) The German’s had purity laws when brewing beer, calling out specific ingredients to be used. If the batch of beer did not meet standards, the beer could not be sold or exported. This law was implemented around the 15th century and was recently uplifted in the mid 1980’s. But you will still find many German brewers adhering to traditional standards. 7.) Not all Lagers look golden in appearance, dark lagers were prominent during the 19th century. During prohibition times, dark lagers were heavily consumed. Dark lagers are popular today. Mexico, brews a Vienna style lager, a family of the dark lagers. Modelo Negra comes to mind and my personal favorite. 8.) Monks brewed lagers, they sold and consumed the beverage. While fasting, monks turned to beer as a source of nutrition. 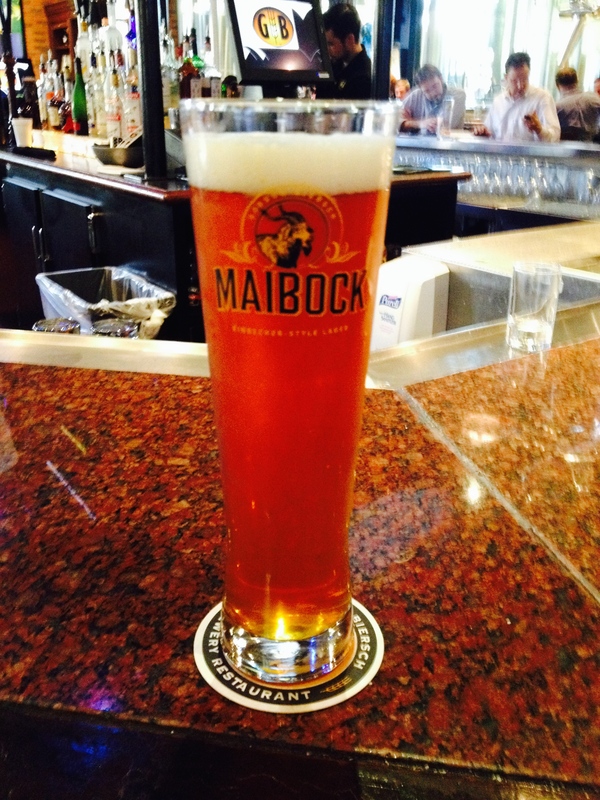 The picture, is a Gordon Biersch Maibock – Maibock means “beer of May.” Bocks generally have higher abv’s, than other style lagers. This bock had a nice flavor to it, nice bitter bite at the end and refreshing. This is a seasonal beer for Gordon Biersch, so it will be out for a limited time. ~ by Golden Foam Notes on May 19, 2014. Now THIS is a blog post! Lots of good info there, especially regarding the history behind lagers. Fasting monks got their nutrition from beer huh… the original beer diet? I will have to try it. Where is Maibock available? I assume I won’t find it at Fresh & Easy. Oh and I always figured Ale’s had a longer fermentation time than lagers because they are usually darker and more bitter, guess I was wrong. I look forward to your next blog, and if I go by recent gaps in between postings… should be somewhere in 2015?